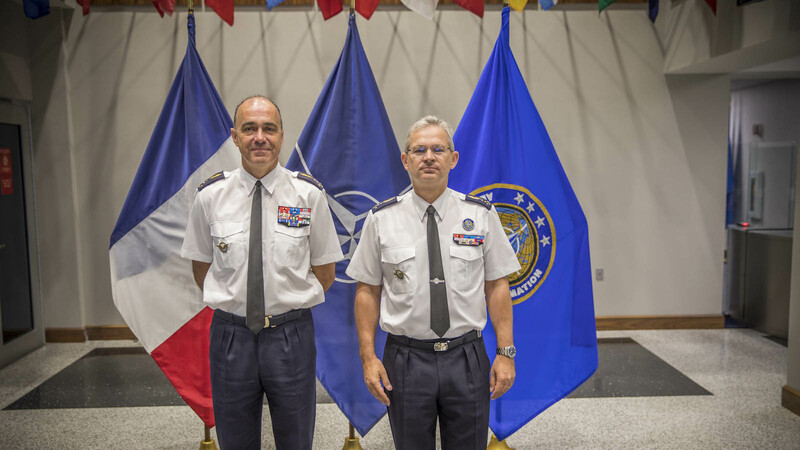 French Air Force Chief of Staff General Andre Lanata visited NATO's Allied Command Transformation Headquarters on May 7. General Andre Lanata was greeted by General Denis Mercier, Supreme Allied Commander Transformation, who was his predecessor at the head of the French Air Force. During his visit, General Andre Lanata met with the leadership of Allied Command Transformation and received strategic briefings. General Andre Lanata started his military career at the French Air Force academy in 1981, where he qualified as a fighter pilot in 1986. Throughout his career, he has acquired extensive experience both as a fighter pilot and as an operational commander. He has flown 146 combat missions in six different theatres of operations and attained more than 3,300 flying hours. Allied Command Transformation is NATO’s home in North America. As one of NATO’s two strategic commands, Allied Command Transformation has been located in the United States since its inception in 2003. The city of Norfolk, and the region as a whole, serve as exceptional hosts to military and civilian personnel from 34 allied and partner nations who are assigned to Allied Command Transformation. NATO embodies the unique bond that unites Europe and North America. The security NATO provides the international community is indivisible. In a world of global challenges, there needs to be global solutions and transatlantic security cooperation. A strong NATO equals a force-multiplier for the United States and every ally. For more information on NATO’s Allied Command Transformation and leadership biographies, click here.